GemLeaf letters are the newest products to use the age-old gilding process – the difference is that Gemini utilizes the latest technology to apply a micron’s thick coating of metal to our own modified premium extruded acrylic stock. Although GemLeaf products hold up well under most harsh UV conditions; because of the risk of corrosion we guarantee these letters for interior use only. 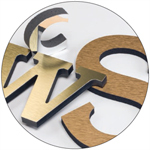 GemLeaf letters are ideal for exhibits and display applications because their laser cut precision allows for the exacting replication of any artwork. GemLeaf letters are the perfect solution for a project that requires the look of metal but the weight or application calls for a more delicate material. Professional offices, medical buildings and law offices are good locations for GemLeaf letters. Exclusive living communities and high-end condominiums, museums, government buildings and places of worship are also ideal locations. 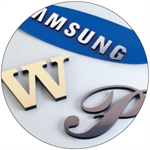 With Gemini’s GemLeaf Letters, you can provide you with elegant, high-end signage without the high-end cost. Gemini uses .030 solid metal sheets of aluminum that have been treated to provide your desired finish. These sheets are then laminated onto your choice of one of 25 acrylic colors or Gemini’s high density (10-12 lb/square foot) foam. The Bern-Lok lamination process is used to adhere the metal sheets to the substrate. This process is proprietary to Gemini, using a combination of heat, high pressure, and chemical bonding. Once the sheets are laminated, they are router cut using precision CNC equipment to provide the best mechanical cut possible. Gemini Metal Laminate Acrylic & Foam Letters are just the ticket when the look and feel of metal is needed but a budget or installation method will not allow for it. Featuring an upscale look at a fraction of the cost, Gemini Metal Laminated Letters and logos are ideal for developing an elegant and professional look for corporate lobbies, government offices and other organizations. Designed for indoor applications, these letters can be used in limited exterior weather conditions thanks to Gemini’s patented Bern-Lok™ process. With seven metal laminates and our full range substrates including our 25 acrylic colors plus Gemini’s high density urethane foam—you have hundreds of design combinations to begin your design process. Used extensively in the awards and recognition markets, the Giclée process allows you the ability to apply your 1200 dpi image onto virtually any substrate. Gemini has the capability to combine this process with any of our other plaque or letter manufacturing product lines. The results are picture perfect. Chrome looking finishes do not necessarily require metal substrates in actual hexavalent chrome baths. Gemini can utilize a near chrome spray-on application to provide you with stunning metal or plastic letters and logos. Imperfections will be seen in the surface of most substrates, as this is not a true plating process. Round face and prismatic styles are recommended for best results. 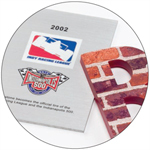 Call for a quote on the Near Chrome finish applied to any of your plaques, letters, or logos. 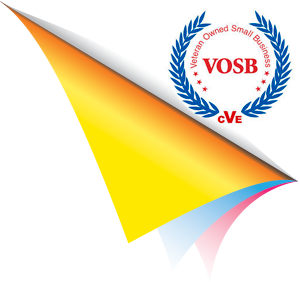 This process may extend lead times on your order by several days. In the history of sign making, the most widely used materials to show significance and distinction have been gold leaf and premium hardwoods. Gemini offers you the capability of designing your sign from these Old World manufacturing techniques. Timeless, yet elegant. Pure 24K gold is applied to any of Gemini’s Formed Plastic or Minnesota Letters. The finished result is not matched by any paint, treatment, or other base metal. Gold Leaf is truly the gold standard of the industry. Completely weatherable, installations last a generation before re-leafing is required due to wear and tear in most applications. Round face and prismatic styles are recommended for best results. Call for quote on custom letter styles. This process may extend lead times on your order by several days.